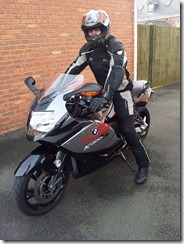 Yesterday morning I picked up my new bike from Williams BMW in Manchester. As the VFR had reached 28K miles after our tour around the Alps it was time to look for another bike. When I bought the VFR back in 2008 it was a bike that needed to do everything, weekend scratching and touring abroad. This time around because I also now have the ZX-9R I was able to look at a bigger bike just for mainly touring on. I had narrowed it down to a few different bikes but the BMW K1300s was the one that seem to tick all the boxes. Williams BMW offered me a great price on my bike in part exchange and they also had the bike I was after, so the deal was done. So I am now the proud owner of a Black/Grey/White & Red 2010 BMW K1300s. It also has all the toys fitted to it as well, ESAII, ASC, RPC, ABS, Quick Shifter, Heated Grips, On Board Computer, centre stand and it also came with a set of BMW panniers as well. It also only had 6400 miles on it, so a great bike at a much lower price than if it was new. It is also very clean as well, so it does actually look as if it is a new bike as well. We left Williams BMW very happy and stopped briefly at home on the way to the Dales to drop off the panniers. We then headed over to Clitheroe by our usual roads. From Clitheroe we followed our usual route to Settle via the minor backs roads of Sawley and Wigglesworth. We passed by Settle and joined the B6479 and passed through Horton in Ribblesdale, we decided to call in at the tearoom just outside Horton in Ribblesdale for a late lunch. But unfortunately it was closed so we continued on and headed for Ribblehead Viaduct, where we turned right on the stunning B6255 to Hawes. We arrived in Hawes and it was fairly quiet so we stopped here and had lunch at Penny Garth Café. We left Hawes and retraced our route back home, stopping briefly at Clitheroe Services to take on fuel. I will now have to try and find fuel stations that sell super unleaded fuel as the Beemer doesn’t really like 95 Ron unleaded. We arrived back home in no time and I am very pleased with my purchase. The Beemer does sound a little bit more mechanical and clunky than the Honda did. It does also have a bit of vibration at around 7000 revs and the standard screen is not high enough for me. It doesn’t turn as sharp as the Honda but with a bit more muscle on the bars I am getting the hang of cornering on it. It is surprisingly economical and I will certainly get a higher MPG on it over the Honda, but that will be offset against the higher cost of the 97 Ron unleaded fuel. But in ever other facet the Beemer completely blows the Honda out of the water and yes it is bloody fast. Martin -- I envy you with the new Bee-Emm ! It looks great and you are obviously happy with it. Helen will be after another BMW next.....!